Like any reputable internet publication that’s interested in spreading the wonders of science, we encourage everyone to ask questions. “Why?” is probably one of the best. But there is a time when you stop asking “WHY?” and just accept that people are going to do weird things. This is one of those times. 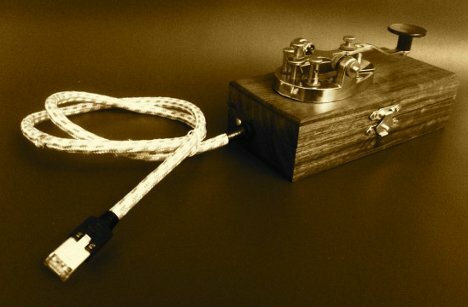 Martin Kaltenbrunner decided to make a telegraph key that posts directly to Twitter using Morse code. For all its strangeness, it’s a sweet little bit of technology: Arduino powered and unquestionably gorgeous, it just plugs right into an Ethernet port and you start tap-tap-tapping to your heart’s content. If you’re the kind of person who needs to build crazy stuff (and we hope you are), the plans to make your own can be found right here. 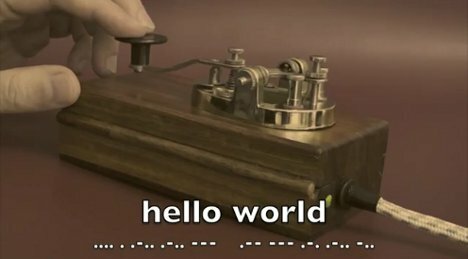 Who knows – maybe the effort and forethought involved in tapping out messages in Morse code might make Twitter a saner place to hang out. See more in Various Gizmos or under Gadgets. February, 2012.